A typical rotary encoder - this one is from Adafruit. Demo ATtiny85 project using a rotary encoder to adjust the brightness of an LED. For this example I used a basic rotary encoder available from Adafruit , or from The Pi Hut in the UK , which gives 24 pulses per rotation. I also tested it with Sparkfun's rotary encoder , which gives 12 pulses per rotation; it's available in the UK from Proto-PIC  or HobbyTronics . 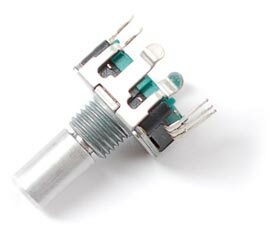 Both of these rotary encoders also incorporate a switch that's activated when you press the knob. They can be persuaded to fit in a breadboard, but you may have to cut off the metal tabs on each side of the body. 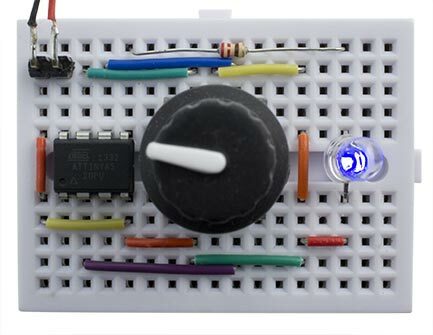 Demo ATtiny85 project uses a rotary encoder to adjust the brightness of an LED. The rotary encoder outputs are connected to PB1 and PB2, and the push button is connected to PB3. The best way to read the rotary encoder is via an interrupt service routine, as this will ensure that you don't miss changes even when your main program is busy doing something else. The interrupt service routine can also check the push-button switch. In fact, a single interrupt-service routine could handle two or more encoders, for applications where you're controlling several things with different encoders. This calls ChangeValue() when the encoder is rotated, or ChangeSwitch() when the encoder switch is pushed or released. I compiled the program using Spence Konde's ATTiny Core . Select the ATtiny x5 series option under the ATtinyCore heading on the Boards menu. Then choose Timer 1 Clock: CPU, B.O.D. Disabled, ATtiny85, 1 MHz (internal) from the subsequent menus; this is the default fuse setting on a new ATTiny85. Then upload the program using ISP (in-system programming); I used Sparkfun's Tiny AVR Programmer Board; see ATtiny-Based Beginner's Kit. Here's the whole Rotary Encoder Demo program: Rotary Encoder Demo Program. 28th October 2017: Since writing this I've realised that there is a simpler and better way of decoding a rotary encoder, as described in Bounce-Free Rotary Encoder, so I've updated this article to use the new procedure. ^ Rotary Encoder on Sparkfun. ^ Rotary Encoder on Proto-PIC. ^ Rotary Encoder on HobbyTronics.